This isn't the first time the United States has stood by the Dominican Republic even as its government has violated the human rights of Haitians. They called it the Parsley Massacre. The 1937 massacre is a haunting flashpoint in a long tradition of anti-Haitian politics -- anti-haitanismo -- on the eastern half of the island shared by the two countries. Now there's a different kind of test for Dominicans of Haitian descent. And the price for failure is deportation. It began in 2013, when a Dominican court ruling stripped up to 200,000 Haitian immigrants and their descendants of their Dominican citizenship -- a stunning and unprecedented reversal of the country’s normal rules allowing birthright citizenship. Thousands of Dominicans were put at risk of being deported to Haiti, where many also lack citizenship. The Dominican legislature followed the ruling with the Naturalization Law, or Law 169-14. In theory, the law is supposed to help disenfranchised Dominicans reclaim their citizenship, but it puts the burden of proof on the victims to provide records of their births -- or even their parents’ births -- in the Dominican Republic. Yet many of these births were never registered, in many cases because Dominican officials deliberately denied records to people of Haitian descent. There's hardly any official reporting on how many Haitians have been successful at obtaining Dominican citizenship, though not even 7,000 were able to apply before the window closed last June. The rest must now register as foreigners in their country. Meanwhile, anti-Haitian lawmakers like Vinicio Castillo Semán are fighting for legislation to deny nationality to all children born to Haitian parents in the Dominican Republic. Dominican President Danilo Medina has claimed that mass deportations aren’t going to happen, and even issued a moratorium on expulsions through June 2015. Since then, though, some 14,000 people have been officially deported, alongside 70,000 others who’ve left “voluntarily.” Even during the moratorium, there were reports of summary removals of people based solely on their appearance. Stripping away anyone’s citizenship is a violation of international human rights law. Indeed, the crackdown has been condemned by many NGOs, such as the Robert F. Kennedy Center for Justice and Human Rights and Amnesty International. Yet the international community has largely shrugged -- as have regional organizations in the Americas. The U.S.-dominated Organization of American States, for example, sent a delegation to Santo Domingo for just two days last July. 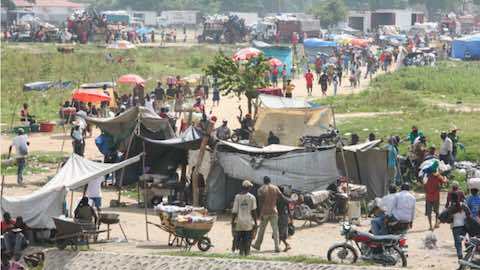 It’s unlikely to take further action, despite appeals from Haiti for international support. It shouldn’t be forgotten that the Dominican Republic carried out its xenophobic, nationalistic programs under Trujillo with the firm backing of the United States, which valued the dictator as an anti-communist ally. Today, that partnership continues in the form of a security partnership. The U.S. has sent the Dominican Republic some $96 million in military assistance since 2000, along with U.S. military personnel and Border Patrol agents to police the Haitian border. A border-control system called CESFRONT, installed in 2006 with U.S. financial aid, has been keeping a tighter grip on Haitian migration -- often by racial profiling. But that hasn't stopped the economic incentive that’s driven Haitians to seek land and work in the Dominican Republic for the better part of the last century. Indeed, some 90 percent of foreign-born migrant workers in the country are Haitians, who often fill crucial -- if uncoveted -- positions in the Dominican labor force. These workers helped the Dominican Republic’s GDP grow an average of 5.4 percent each year between 1992 and 2014, even as inequality has boomed and the number of poor people has doubled since 2000. Given the U.S. government's undeniable role in Dominican politics, there should be more aggressive steps to withhold funding and condemn these human right violations. If Washington stands by, it will be complicit in the abuse -- just as it was during the Cold War. More than 80 years since Trujillo’s mass slaughter, Dominicans of Haitian descent remain economically disadvantaged and mired in a time-capsule of repressive politics. It's time to let go of Trujillo's legacy and embrace a more prosperous partnership between the Dominican Republic and Haiti, one that can be better remembered than the Parsley Massacre. Latin America: "Dominican Republic Deporting Its Haitians"